The bride puts on a show for her bridesmaids once she’s all dressed. As photographers, we love to see the bride and groom having fun as they pose candidly! Plus, who wouldn’t be smiling getting to play with such a pretty veil and surrounded by great friends? It’s always important to us to find a balance between posed portraits and candid moments when we photograph weddings. Two bridesmaids smile back at the bride as they happily watch their best friend full of excitement and bliss on her big day. The white of the bride’s hair decorations, her sheer veil, and her creamy white wedding dress paint the picture of beauty and elegance. 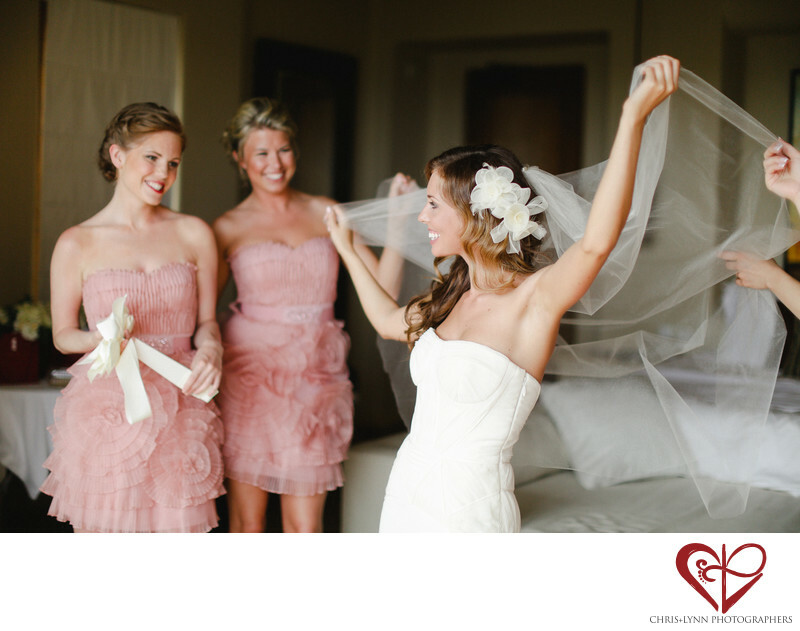 Behind her, the pale pink tones of the bridesmaids’ dresses create a contrast of color tones. 1/2000; f/1.2; ISO 200; 50.0 mm.